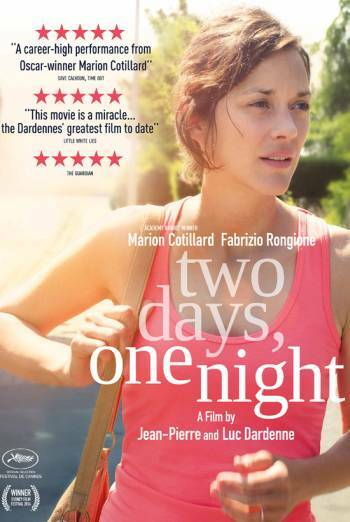 There could hardly be a better time for a movie like TWO DAYS, ONE NIGHT to appear. That it was bypassed by the Academy of Motion Picture Arts & Sciences' shortlist for this year's Best Foreign Language Film is ridiculous. But, hey, that's Hollywood. (Bring back The Blacklist, boys!) Its tale -- of an employee at a solar-energy manufacturing facility who is suddenly down-sized by her bosses via a vote taken by her co-workers on whether they will receive a large Christmas bonus in lieu of the employee's holding on to her job -- is a near-perfect look at the joys and rewards of Capitalism in the workplace. 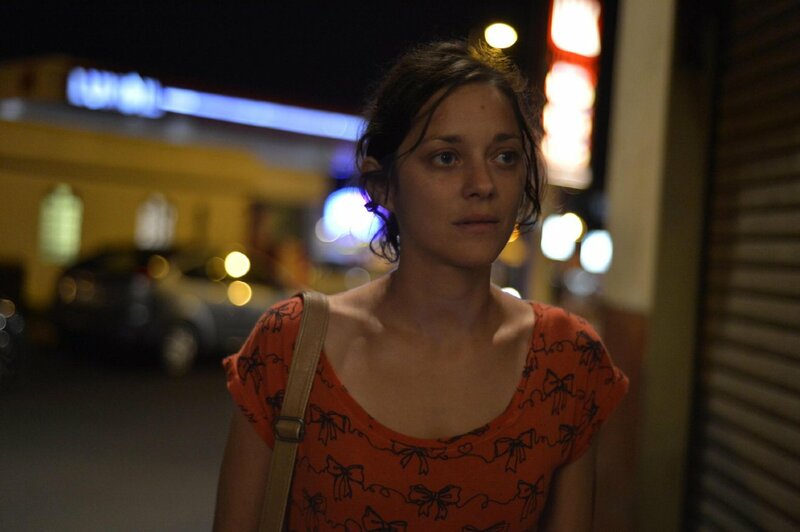 What that employee, Sandra -- a fierce and fragile performance by the wonderful Marion Cotillard (above and further below, in pink) -- decides to do about her situation makes up the heart of this unusual movie. 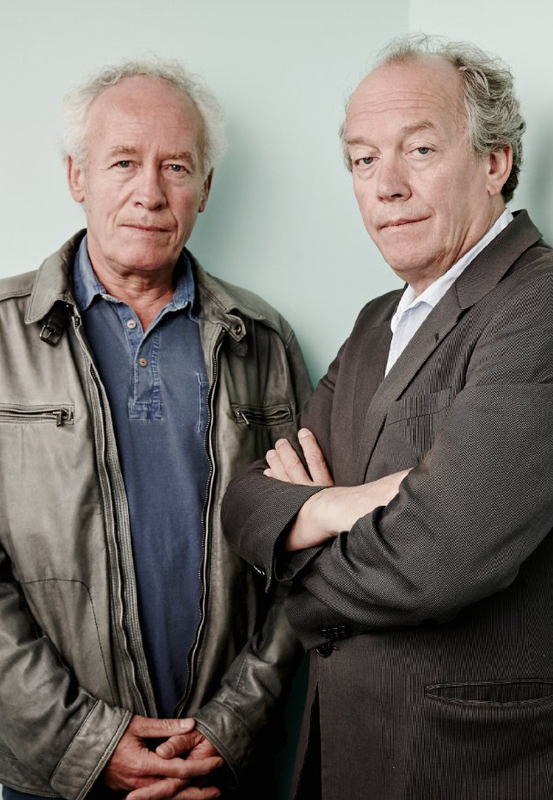 One of, and maybe the best of the films to come from the Belgian brothers Jean-Pierre and Luc Dardenne (shown at right, with Jean-Pierre on the left), the movie taps into so much that the western world is experiencing today regarding employment, family, health (mental and physical) and the idea of Socialism vs Capitalism. After the initial shock of the news abates, Sandra's husband and her best friend/co-worker urge her to demand another vote (the first one appears to have been rigged by a boss who intimated that if the crew voted to keep Sandra, another of them might be downsized). The remainder of the movie details Sandra's search for her co-workers over a weekend spent urging, cajoling, asking and hoping for their support. If all this sounds a bit predictable, the result is anything but. Responses from the co-workers run the gamut. That bonus of one thousand Euros is nothing to sneeze at, and some of the workers need the money rather desperately. Yet each situation is different, and its result often surprising. Among the most moving is Sandra's meeting with an employee (newcomer Timur Magomedgadzhiev, above) to whom she acted as mentor. Another, taking place in a laundromat at night, reveals as much about the situation of Sandra's co-worker as it does her own situation. Some meetings lead to anger and, in one case, violence. Through it all Sandra's husband (played by Fabrizio Rongione, above) encourages and helps his wife along. She certainly needs this for, as we soon learn, Sandra has had a severe bout of depression, for which she was given a leave of absence from work. There are times throughout the movie when viewers may wonder just how capable Sandra is of actually doing her job. It is greatly to the Dardennes credit that they don't hand us characters who fall easily or completely into heroes and villains. Best of all, they let us see and understand how Capitalism works to undermine the worth of the individual by keeping everything focused on profit, while ensuring that the workers fail to see their situation from a collective perspective. In the process the Belgian brothers may have created a new kind of genre -- one especially appropriate for our times -- the "employment thriller." What will happen to Sandra's job takes on increasing suspense, and the outcome may surprise you. It and its movie go beyond mere good and bad, happy or unhappy endings, to confront the entire situation in a manner more subtle, thoughtful and humane. Two Days, One Night -- from Sundance Selects/IFC Films and running a brisk 95 minutes -- opens this Wednesday, December 24, in New York City at the IFC Center and Lincoln Plaza Cinema, and in Los Angeles at in the Los Angeles area at Laemmle Theaters, beginning January 9.